Was it his Germanic heritage from a nation who loves traditional music and marching songs, or was it the German 'Panzerlied' as sung by the Panzer Truppen in the film 'The Battle of the Bulge' or his dream to inspire tradition into the South African Armoured Corps? During a team building get together with his senior staff members, he asked them what they knew about 'Traditions in the Armoured Corps' and was surprised to learn that in actual fact none really existed. With the impending celebration of the 25th Anniversary of the School of Armour looming, Col Heinze wanted something unique for this gala occasion. 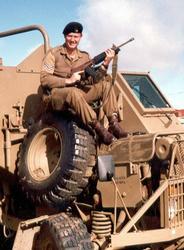 He approached a Bloemfontein vocalist/composer, Phillip Kotze (who incidentally served in the Armoured Corps at 1 Special Service Battalion during his National Service) with the musical score of the German 'Panzerlied', requesting him to compose lyrics for the South African Armoured Corps. 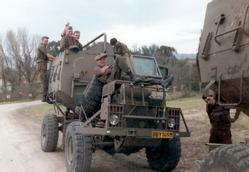 He added his ideas and emphasised that it must be inherent to Southern Africa and to the SA Armoured corps. Phillip Kotze then composed the music and lyrics and sung it to Col Heinze, who listening to the words and music was overjoyed and gave his blessing to Phillip to finalise the compositions. 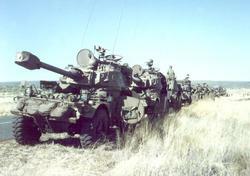 On the evening of 11 October 1991, Philip Kotze sang the "Pantserlied" and the Tanker's Prayer to the personnel of the SA Armoured Corps and guests attending the 25th Anniversary celebrations of the School of Armour. Both of these sets of lyrics and music remained in the background of Armour units until January 1992 when, during the first ever annual Training Commencement Ceremony (also instigated by Col Heinze) and with the lighting of the Flame of the Armoured Corps (made by WO1 N.J. Coertze, RSM School of Armour) the "Pantserlied" was played followed by the Tanker's Prayer. The "Pantserlied" now eventually got through to Armour personnel and together with the Tankers Prayer became part of Armour ceremonies and traditions and were also played during Shot Action get-togethers. 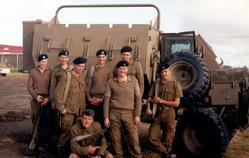 During the early stages of 1994, Col B.C. (Chris) Gildenhuys, then newly appointed as Officer Commanding School of Armour, approached Phillip Kotze requesting him to translate the "Pantserlied" into English. - and to translate it! I hope you will find it in order..."
(translated from the original Afrikaans letter). 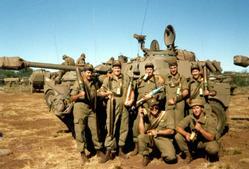 Col Gildenhuys, to his satisfaction, approved the words of 'The Song of the Armoured Corps'. 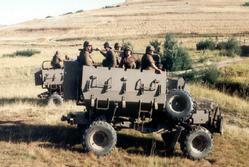 With the celebration of the SA Armoured Corps' 50th Anniversary, an African male choir, trained and conducted by Chaplain (Ds) Johan Janse van Rensburg of 1 Special Service Battalion, sang the "Pantserlied" and Tanker's Prayer during the Gala Evening held on 14 September 1996 in the Sand du Plessis theatre in Bloemfontein. 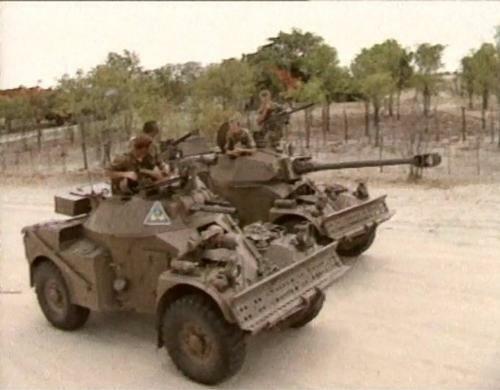 On 11 September 1998 members of the Armoured Corps sang the "Pantserlied" and the Tanker's Prayer for the first time and guests attending a 'Shot Action' held at 1Special Service Battalion. The Officer Commanding 1 Special Service Battalion, Col D.J. Laäs, remarked that from this date, during all 'Shot Actions' these two songs should be sung. 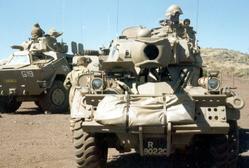 To date all Full Time and Reserve Force Armour Units, immaterial of colour or creed gustily sing these two songs. en reën dit dag, en nag aaneen. getrou aan God, ons land, ons werk. ander hoop, en steun op jou. staan jy pantserman, sterk soos 'n rots. Steeds vorentoe, bly ons enjins dreun. 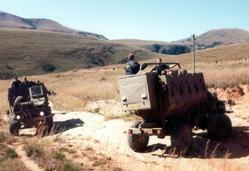 en ons bly bid: "Kom lig, kom dag"
word ons geprys, gevrees, geken! as die winterswind, oor ons kom waai. laat ander weet, laat hul, verstaan. getrou aan God, my land, my werk. the scorching heat, of a summer's day. and rain is pouring down like tears. Faithful to God, our land, our all. Others do rely on you! That's the oath we pledge: "Ever be true!" Forward still our engines fight. and we keep praying: "Come day, come light." we are respected, as team, as one! And when the winds of change do come. Faithful to God, my land, my all. Armoured man, still be true.